I’ve been excited about alternative investments since my early days as an aspiring real estate investor and peer-to-peer loan shark. If you’re bored/scared/disillusioned with the “traditional” stock market and mutual fund asset classes, or if you just are curious what else is out there, this post is for you. 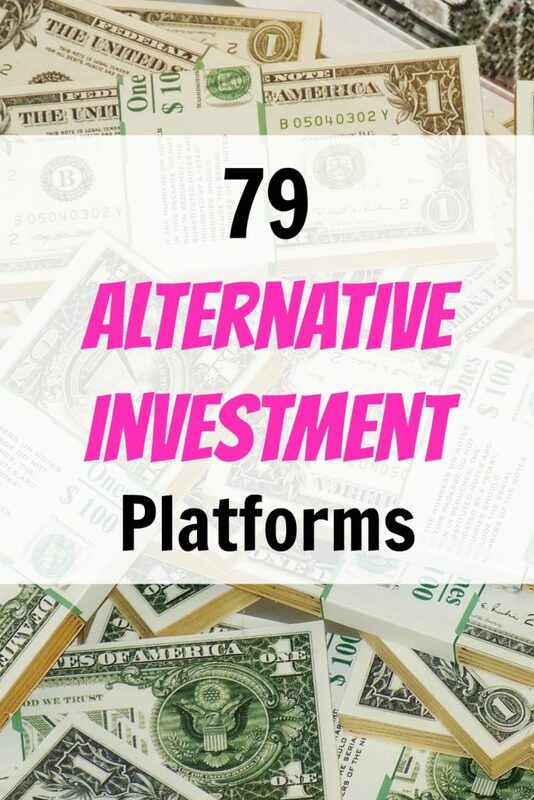 The cool thing is we’re living in a golden age of alternative investment opportunities, and it was quite an undertaking to compile these options. Investing is a way to paid over and over again from work you do once. Or at least that’s how I’m coming to look at it. Disclaimer: This article is NOT investment, tax, or legal advice, nor is it a solicitation for investment. I have an affiliate relationship with some of the companies listed below. Please do your own due diligence when evaluating any investment opportunity, and know that “alternative” doesn’t necessarily mean “better,” since individual needs and goals vary. Your current financial situation. Some of these investments are only open to high net worth or high income individuals. Your near-term money needs. Is there a chance you’ll need the money for a major purchase in the near future? Your investment goals. Are you looking for cash flow? Long-term appreciation? Tax advantages? Your risk tolerance. Is this “play money” you can afford to lose? Or is this a retirement nest egg you’re counting on? This would also be a good time to share my “net worth” theory of investing, that is, with any new investment, I’d recommend starting with a small sliver or your net worth, and increasing your holding over time as you feel more comfortable. Don’t know your net worth? It’s just assets – liabilities, or what you own minus what you owe. For a free tool to track all your accounts in one place and get a snapshot of your net worth, you can’t go wrong with Personal Capital. This post is broken into several different “alternative” asset classes, which are then broken down into their openness to accredited and non-accredited investors. Real estate investing comes in many forms, including wholesaling, traditional rentals, house hacking, and everything in between. Over the last two years, I’ve been increasing my real estate holdings as a percentage of net worth (still less than 10%; shooting for 20% long-term) — and that’s mostly taken the form of public (like Vanguard’s VNQ) and private (like Fundrise, below) REITs. I like the cash flow and the diversification that comes with owning several properties instead of the liability that could come with just one direct investment. Let’s just say I’ve been burned in the past! You may not consider real estate “alternative,” but new platforms and technology are opening up new ways to participate in the real estate industry with less work. Fundrise was my first foray into alternative real estate investments (and I have since joined their affiliate program). They have several “eREITs” that own or hold investments in commercial properties all around the country. The platform is open to all investors with a $1000 minimum and so far, the eREITS I own have paid 8-12% dividends every quarter. What appealed to me with Fundrise was the quarterly cash flow, low minimums, and being automatically diversified in not having to pick-and-choose individual deals. Roofstock is the leading marketplace for “turnkey rental” properties, single family homes that already have tenants and property management in place. With as little as $20,000 down, you can begin building your real estate empire. Most Roofstock investors are drawn to the platform seeking more attractive investments than they can find in their home market. If the 1% rule isn’t realistic in your neighborhood, you might find opportunity being a long-distance landlord and generating gross yields of 8-20% based on the listings on their platform. It’s a slick site to browse and compare deals across multiple states. Rich Uncles has a pair of REITs that own a growing portfolio of income-producing properties. Groundfloor is a revolutionary player in the private lending crowdfunding space because for a couple reasons. First, their platform is open to non-accredited investors (though only in a handful of states at the moment), and second, the minimum investment is just $10 per project. You pick and choose the deals you want to invest in, and there’s no REIT option at the moment. RealtyMogul was one of the first real estate crowdfunding sites I came across, and they have two “MogulREIT” options that are open to non-accredited investors with relatively low minimum investments (starting at $1000). The platform also offers private lending deals for accredited folks that target returns of 12-14%. When I looked at their REIT they only had 3 properties in it, so I decided that wasn’t very diversified, but it’s since grown to house 14 different properties and paid out an 8% annualized dividend last quarter. HomeUnion – Provides turnkey rental property search and acquisition services in several markets. 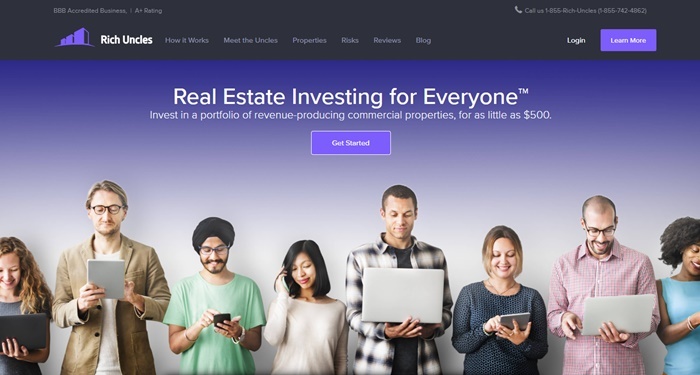 On PeerStreet, accredited investors participate in private lending crowdfunding deals, usually for fix-and-flip projects on residential properties. Stated returns range from 6-12%. 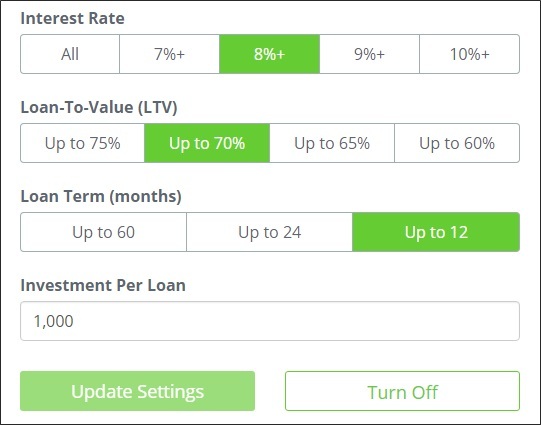 What I like about PeerStreet (disclosure: I’m an affiliate and investor) is that the loan terms are short — usually 18 months or less — and they’re backed by real estate that usually carries at least a 30% equity cushion. I recently had one property that went into foreclosure, but because of the equity cushion, PeerStreet recouped the entire $1000 principal and some interest as well. RealCrowd provides an online platform for accredited investors to access, review and invest in “private money” real estate transactions on commercial property like multifamily buildings, retail developments, office buildings, and industrial buildings. Minimum investments vary by property but range from $10,000-$100,000. CityVest is a real estate investment marketplace providing accredited investors with insider access to pre-screened and institutional real estate investments. The site advertises 10-25% passive returns and the minimum investment is usually $10,000. YieldStreet – $5000 minimums, targeting 8-20% returns. AlphaFlow – Buy a diversified real estate portfolio, starting at $10,000. EquityMultiple – minimums as low as $5000, targeting 6-12% returns. Money360 – $50,000 minimums, targeting 8-10% returns. Patch of Land – $5000 minimums, targeting 9-12% returns. LendingHome – $5000 minimums, targeting 8-10% returns. Iintoo – $25,000 minimums, targeting 10-15% returns. 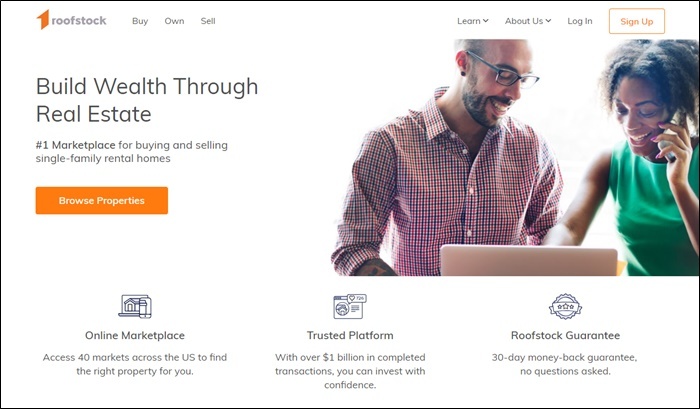 PeerRealty – $5000 minimums, but doesn’t seem to have the traction of other platforms. Mark “The Land Geek” Podolksy calls investing in raw land “the best passive income model.” The system as he described it to me on the podcast involves finding out of state landowners who owe back taxes on their parcels. This is public information for each county, so it’s just a matter of seeking it out. Then he sends those landowners an offer letter, and begins the negotiation process. Once he’s taken ownership or control of the property, he can re-sell it for a cash flip or sell it on an owner-carry contract for an attractive monthly payment like $99 a month for 72 months. Side Hustle Nation member Josh Brooks described a similar process in his land investing adventures. Tax liens can be an attractive alternative real estate investment for a couple reasons. The first is they pay solid interest rates, often 8-15% or more, and they’re backed by state and local governments. Next, the tax lien certificate has the real property as collateral, meaning if the owner doesn’t pay his or her back taxes, the lien holder could take ownership of the property for pennies on the dollar. The Kislak Organization appears to be one of very few companies organizing the sale and consolidation of tax liens online, but the information they share publicly is very limited. Property Partner is an online platform that allows users to invest in buy-to-let properties in the United Kingdom. They target an 8.4% annual return, and even go further by breaking that down into 5.2% capital growth and 3.2% dividend yield. The minimum investment is just £50.00. LendInvest is an online peer-to-peer lending platform for residential and commercial mortgages in the UK. The minimum amount that can be manually invested is £100 per property, and LendInvest also offers an aggregate fund to diversify your holdings. Property Moose is a real estate firm that allows users to invest in a wide range of properties in the United Kingdom. The minimum investment is just £10 and the website “projects” returns of 10%+ for equity investments and 8-10% fixed returns for debt. Business lending is a sub-category of peer-to-peer lending where you can lend your money to growing businesses that need extra cash to expand. Different platforms offer different “types” of loans and cater to different types of businesses, but the common thread is the companies don’t have to dilute their ownership stake because they’re just paying interest on debt instead of giving away equity. And for investors, business lending represents the chance to support small business growth while earning attractive returns. StreetShares is a unique platform that allows you to invest in / support veteran-run businesses and earn a fixed 5% return. The product is called the Veteran Business Bond and is open to all investors with just a $25 minimum contribution. You can access your money anytime for a 1% fee; or withdraw fee-free after a year. On Kickfuther, you can help support growing companies by lending them money on purchase-order backed inventory. These small businesses are often plowing all their cash back into more product to sell, and pay 5-20% annualized interest to help them acquire inventory faster. I made 8 different Kickfurther loans last year, totaling around $1800, and 5 are pretty seriously past due. A couple have been paid back in full and one more is on schedule, but I’m hesitant to put more cash into Kickfurther until those other loans mature. The company will want me to note that at the time I lent, the loans were not required to have purchase orders in hand, meaning now every listing on the site is already “spoken for” — which should help improve the performance. On the plus side, I was able to fund my loans with a credit card, which helped me meet the sign-up bonus minimum spend requirements. ThinCats – Invest in British or Australian business loans and earn up to 9% returns. £1000 minimums. Lending Crowd – Earn a target rate of 6-8% supporting British businesses on LendingCrowd, where the minimum bid is £20 per loan. On Funding Circle you can lend money to established and growing American small businesses. The interest rates vary from 5% to over 20%, but it’s unclear how much money you’d have to invest to get started. Some of Funding Circle’s literature mentions a $500 minimum per loan, which matches what Dr. Kenyon Meadows said on The Side Hustle Show, but other areas of their website mention a $250,000 minimum. P2BInvestor – Help small businesses grow with short-term, asset-backed investment opportunities. ApplePie Capital – Earn 7-12% returns backing “highly qualified franchise businesses.” $2500 minimum per loan. Wunder Capital – Earn up to 8.5% investing in solar energy projects. Peer-to-peer lending offers the chance to lend money to your fellow citizens and earn interest on your loans. Basically you’re buying fractional ownership of small loans, usually for debt consolidation. Still, I look at this as a cash-flow play, and I think 5-9% returns are reasonable. I’ve been a Prosper investor (I’m also an affiliate) since 2009 and have earned an annualized net return of 9.37% over that time. Prosper is exciting because of the low minimums — a $25 investment per loan is all it takes to get started — and the promise of monthly cash flow. 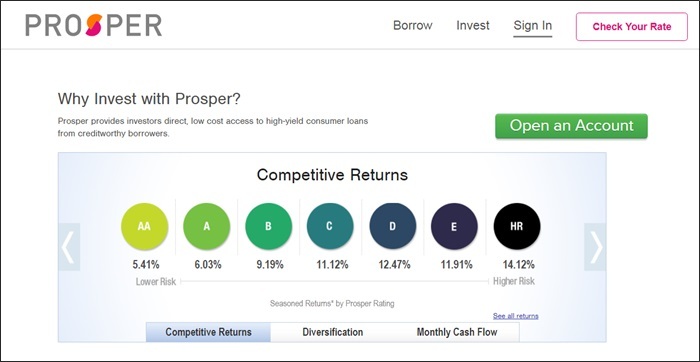 While my overall returns on Prosper are still pretty strong, they’re several points lower than what the platform had been reporting for several years. They chalked it up to a math mistake, which could be the truth, but it still feels a little shady. Lately my cash flow has been suffering and I’m actually reducing my Prosper position and instead testing out some of the other alternative platforms on this page. Lending Club operates on a similar model to Prosper and is actually a little larger. Annual returns for a diversified portfolio of notes range between 5% and 7%. The minimum investment is also $25 per loan. What is the expected return or range of returns? current advertised rates of return are 3.5% for Access, 4.5% for Classic and 6.5% for Plus. This European peer-to-peer lending platform provides loans to residents of Spain, Estonia, and Finland. They’ve been in business since 2009 and according to their site, over 80% of investors have earned at least 9% on their money. The site is open to European Union residents and residents of Norway and Sweden, with a minimum investment per loan of just €5. If you’re outside the EU, you must be accredited to invest. Peerform – Site looks super outdated, but apparently they’re still in business. Afluenta – Open to investors in Argentina, this Latin American peer-to-peer lending site offers eye-popping returns of up to 43%. RateSetter – The UK site proclaims a 100% repayment record, which might explain the less-than-exciting 2.7% returns advertised. QuidCycle – Another UK platform, with loans from 3.9-6.1%. Bitbond – Earn interest on your Bitcoins on this peer-to-peer lending platform. Why let venture capitalists have all the fun? A new wave of platforms are carving out a name for themselves in the “equity crowdfunding” space, which allows you to back promising startups for a share in their future glory. Be prepared to potentially wait a long time to see a return, since it usually takes a public stock offering or acquisition to cash out your shares. Netcapital has opened startup investing to non-accredited investors with just a $99 minimum. However, there are investment limits based on your income and net worth. The focus is on mission-driven startups, and you can invest in equity crowdfunding campaigns for the companies you believe in. Invest in startups on the Wefunder.com platform, which is now open to non-accredited investors with minimum investments of just $100. SeedInvest – Invest as little as $500 in pre-screened startups on SeedInvest.com. Seedrs – European investors can participate in equity crowdfunding campaigns starting at just £10. StartEngine – Support innovative startups on this equity crowdfunding campaign with fixed upside. Crowdcube – Invest in early stage British startups for as little as £10. Accredited investors can back well-known venture capitalists and angel investors in their early stage startup investments on the high-risk, high-reward Angel.co platform. You can invest in one-off companies following the lead of other high profile investors you trust, or buy into the AngelList Access Fund, which diversifies your startup investment across 150+ companies. The company cites an unrealized internal rate of return of 46% for a recent batch of investments, but notes that is likely to decrease significantly before any returns become realized. CircleUp.com links accredited investors with “breakthrough brands” in need of capital. At press time, prospective and historical returns were not listed and your investment gains are tied to eventual “exits” or IPOs of the startups, which could take several years, if ever. Accredited investors can invest in promising agriculture businesses or let AgFunder.com put together a fund of curated companies to invest in on their behalf. No prospective returns are listed, though AgFunder indicates it’s raised more than $32 million from nearly 3,000 investors. The minimum investment is $100k for the fund or $25k for investing on a deal-by-deal basis. Gust – A global platform for sourcing and managing early-stage startup investments. OurCrowd – Hand-selected equity crowdfunding with $10,000 minimums. 1000 Angels – An interesting membership-based model (from $2500 a year) to access their pre-vetted startup investment deals. FundersClub – Select one-off deals or buy into a fund of several startups. SharesPost – Not exclusively for startups, but an option to invest in other privately held companies a well. If you have more time on your hands, or access to capable managers, perhaps you just want to buy an existing business outright. Here are a few options to do just that, both for online and offline businesses. Empire Flippers is a well-established online business broker specializing in websites in the $10,000 – $1,000,000 range. Websites normally sell for a multiple of their monthly profit, usually 18-36x, depending on risk factors like longevity, growth curve, and the time it takes to manage. That means for $100,000 investment, you could potentially pick up a site (or portfolio of sites) earning $2700-$5500 a month. On the podcast, I had a chance to sit down with co-founder Justin Cooke to hear how it all works. 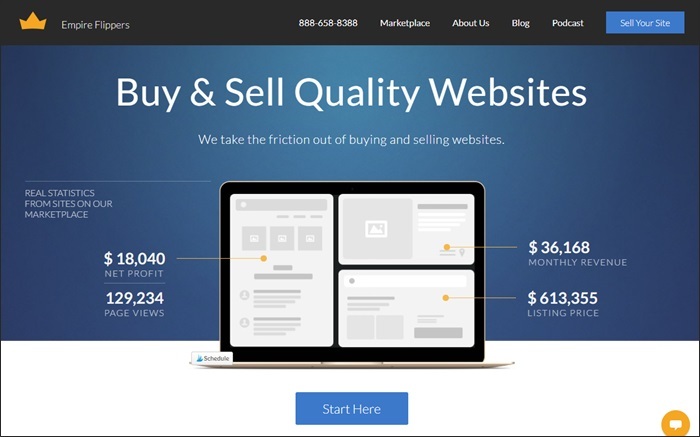 Flippa – Search for and buy cash-flowing websites. The FBA Broker – An online business broker specializing in Amazon FBA businesses. FE International – Buy websites earning $100,000 or more in annual profit. BizBuySell – Long-running brokerage focusing on offline businesses. Quiet Light Brokerage – A marketplace for 6- and 7-figure ecommerce, Amazon FBA, content, and SaaS websites. On the surface, currency decoupled from government sounds appealing and futuristic, but we’re still in the early days of Bitcoin, Ethereum, and many others vying for leadership and widespread acceptance in this space. Still, several “name brand” companies have started to accept Bitcoin for payments, including Microsoft, Subway, and Expedia. Coinbase seems to be the leading marketplace to buy and sell alternative currencies. The platform works like a digital wallet and bank vault for your invisible money. Referral bonus: Buy $100 worth of digital currency and get $10 in free bitcoin. Coinbase offers an interesting feature set like insurance in case their systems get hacked and your account gets drained, and the option to set up a recurring monthly investment. CEX – A leading Bitcoin and Ethereum exchange. Coinmama – Another site to buy and store Bitcoin, though when I checked they seemed to be charging a 6.5% premium above the current market value. Bitcoin IRA – Invest in Bitcoin with your retirement account. Coinsecure – India’s fastest 24/7 realtime Bitcoin trading platform. Bitquick – Buy Bitcoin in just 3 hours. Apparently it normally takes longer? Masterworks is the first company to democratize ownership in multi-million dollar, blue-chip paintings, for retail and accredited investors with minimum investments as little as $1,000. According to Artprice, blue-chip art has appreciated 8.9% since 2000. Non-institutional investors can gain access to previously restricted hedge funds and private equity investments through DarcMatter, a service that pre-vets these deals for accredited investors. Non-accredited investors who want to get in the hedge fund game might consider a hedge fund ETF, though returns for most of these funds have actually lagged the general market index funds for the last several years. Social trading platforms are kind of a hybrid between traditional stock market investing and social media. You can see what moves the experts or top performers are making with their portfolios and follow along with your own money if you like. The best-known of these social trading platforms is eToro, with more than 5 million members. The theory is if you don’t have time to research the market yourself, why not delegate that work to the “crowd” that does? You can find other investors with similar strategies, watch their moves, read their reasoning, and copy quickly. Note: eToro is not yet open to US investors. Instavest – Follow market “Leaders” by copying their stock moves. Smaller than eToro but open to US investors. For a more traditional approach in terms of the assets you’ll hold, but optimized with a healthy dose of modern tech, you might consider a roboadvisor. M1 also allows you to purchase any security, regardless of share price, with fractional shares. Berkshire Hathaway, here we come! This makes diversification easy, and you can even set a schedule to automate your investing. Betterment is the largest roboadvisor and estimates its technology will earn you 2.66% better returns per year than a typical investor. Among the tools that help you get there are automatic diversification and rebalancing, tax loss harvesting, and lower fees. Betterment charges a 0.25% management fee. Set up automatic deposits and let it ride, knowing you’ve made a science-backed choice for long-term returns. Wealthfront – A similar service with the same 0.25% fee. FutureAdvisor – A digital financial advisory service that charges 0.50% as a management fee. Hedgeable – “Private wealth for everyone” through sophisticated automated investing. Rocket Dollar is an interesting new service that lets you set up your a Self-Directed Solo 401(k) or IRA. That means you can invest in any asset class allowed by the IRS, including real estate, precious metals, and of course the more traditional stocks and bonds as well. The company charges a nominal upfront fee to create your account, and a flat monthly fee to maintain it. They don’t charge a percentage of assets. 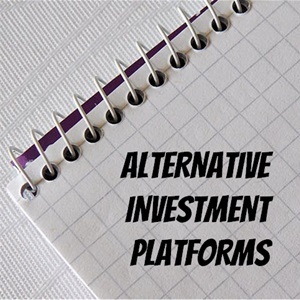 Have you tried any of these alternative investment platforms? What’s your experience been like? Very awesome post. This blog post had perfect timing, you have given me some ideas about where I should invest next. I have been doing some serious research on investing….and to be honest, I don’t think anything is touching real estate right now. I mean for pete’s sake, right now as we are typing is in real estate lol. Keep up the great work Nick, I will be emailing you soon my friend, its been awhile. Epic post! I was waiting and waiting for you to mention Betterment and there it was, right at the very end. It seems like a very promising platform especially with the ultra low fees. Although it’s a bit out of line with the post another great option is investing through low cost index funds such as Vanguard ETF. Returns track the market and fees are ultra low. What a great post. I’ve looked into or tried many of the options here and also learned about some new ones. I’m always on the lookout for more investment opportunities! 1) My LendingClub and Prosper rates both improved by using bots for a nominal fee. I’ve used both Lendingrobot and Bluevestment with good result. It seems like overall returns in this area are slowly declining though. 2) AHP has a great purpose and mission statement along with steady dividend payments in the real estate market-so far a solid 12% annual. 3) I’ve achieved ~18-20% annually using a USD currency margin lending bot on Bitfinex. When daily rates spike up to 1-4% I’ll transfer a larger chunk of funds there and remove when they settle down again. You can lend bitcoin as well, but I prefer to keep my exposure to bitcoin volatility separate. I just use this for cash flow. It’s free but requires a bit of very low level programming that shouldn’t be too hard to figure out. 4) I’ve also gotten into forex averaging about 8% a month. This takes a LOT of work though, so YMMV and prepare to do your homework. May I ask how this USD currency margin lending bot on Bitfinex works? How would I get started to try this out? Another amazing post, Nick. Thank you for compiling all this information. I’ve come away with 6 new potential investment platforms I’d like to test, having already started with Groundfloor based on your last mega-post. Thanks Karen! Keep me posted! Wow! So many great options! Sometimes I get caught up in what I’m already doing and lose sight of the new stuff out there. Thanks for sharing! On this platform you can buy the future royalty income from popular music. Awesome list Nick! I am definitely going to take a look into these after getting tired with some of my old investment strategies. I’ve been wanting to get into real estate investing but thought it would just cost way too much. Perhaps one of your solutions will work for me! Excellent article but you missed few other investment ideas like domain names. Huge potential in domain investment. if you need more details contact me, i can help you. This is a great post packed with great ideas. I’m more of a conventional REI but have looked at Fundrise and have gotten mixed results. So far more negative than positive however you seem to like it so far. I’ve also used lending club however lowering my exposure due to lower than expected returns (~4.7%). Betterment is also a good one that I’ve enjoyed using now for several years. It would be great if you could include a table sharing your thoughts on how all these options stack from a risk analysis point of view. Anyways, thanks for a great post! In the Business Lending section, I recommend adding rebuildingsociety.com for British business lending, as they have achieved their FCA authorisation, so they are one of the few regulated platforms. Historic returns are an average of 9.8% pa net of fees and defaults, though this may change in the future. They have over 5 years history and have started offering the innovative finance ISA to lenders in the UK. Capital on loan is at risk. Also look at MarketLend.com.au in Australia, for a business revolving credit platform that is doing very well to help businesses finance purchases. This are some great investment ideas. Buying businesses is a great idea, but one of the riskier options. THe fact that you can get a 50-100% ROI off of buying a website is fantastic, but only if you put in the time to keep it fresh and compliant with Google. However, if you already work on websites it is a great option for you. This is a great post, thanks for taking the time to create it. I have referred back to it a few times to set some goals this year. Currently looking into Groundfloor, Seedinvest, and Royalty Exchange. Great list, thank you for this article. I would like to add another alternative investment – gold coins. I’ve decided to invest in rare Australian gold coins – https://www.kjc-gold-silver-bullion.com.au/NC/australian-gold-sovereigns/550 – and I have to say, I am pretty satisfied with the increase of their value over time.